Should a cookie be crispy or chewy? With this amazing recipe you don't have to choose. This super-simple chocolate-hazelnut mousse is ready in just 30 minutes. Chocolate fondue is decadent and super-fun to eat. No oven? No problem. This luscious chocolate custard is ready in just 20 minutes and doesn't need to bake. This simple, refreshing dessert gets its rich color and delicious flavor from cranberries. Pastry chef François Payard's incredible, simple chocolate cookies are completely gluten-free. Served warm or cold, this fast dessert is delicious both ways. Dipping strawberries in chocolate is incredibly easy and delicious. These incredibly easy cookies require only four ingredients: puffed-corn cereal, peanut butter cups, peanut butter and chocolate sprinkles. 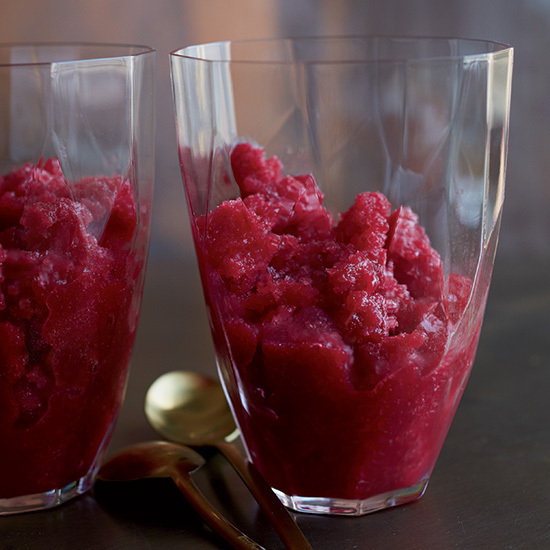 Store-bought raspberry sorbet is a great shortcut for this fantastic dessert cocktail. Need to make dessert in 7 minutes? Nothing is easier than these chocolate toasts, which feature a sprinkling of sea salt and extra-virgin olive oil.